UNITED NATIONS (AP) — For the first time since taking office, President Donald Trump endorsed a two-state solution as the best way to resolve the conflict between Israel and the Palestinians as he met Wednesday at the U.N. with Israeli Prime Minister Benjamin Netanyahu. Trump told reporters that he believes that two states — Israel and one for the Palestinians — “works best.” He has previously been vague on the topic, suggesting that he would support whatever the parties might agree to, including possibly a one-state resolution, which might see the Palestinian territories become part of Israel. In his earlier comments, Trump said his much anticipated but still unreleased Mideast peace plan could be presented in the next two to four months, but was not specific as to timing. Trump has been heavily criticized by the Palestinians for a series of moves that they say show distinct bias toward Israel, starting with his recognition last year of Jerusalem as Israel’s capital. The Palestinians also claim the holy city as the capital of an eventual state. Earlier this year, Trump followed up on the recognition by moving the U.S. Embassy in Israel from Tel Aviv to Jerusalem, a step that was widely protested by Palestinians and others in the Arab world. His administration has also slashed aid to the Palestinians by hundreds of millions of dollars and ended U.S. support for the U.N. agency that helps Palestinian refugees. The Palestinians reacted cautiously to Trump’s remarks, noting that a two-state solution has long been the goal of peace efforts, including a broader Arab-Israeli plan that would see Arab states all recognize Israel if the Palestinians got an independent state. Nabil Abu Rudeineh, spokesman for Palestinian President Mahmoud Abbas, said the Palestinians remain committed to their demand for a state based on the borders before the 1967 Mideast war and with East Jerusalem as its capital. 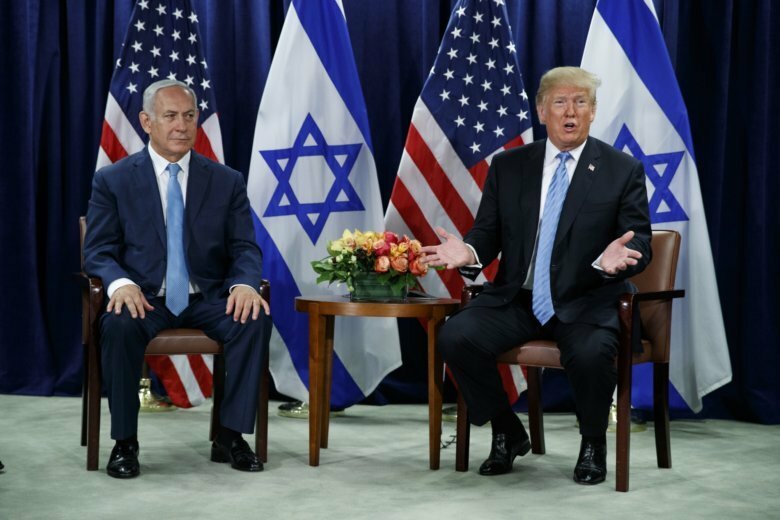 Trump and his national security team have defended their position, saying that decades of attempts to forge Israeli-Palestinian peace have failed. He said Wednesday that the embassy move would actually help peace efforts by recognizing the reality that Israel identifies Jerusalem as its capital. But he added that Israel would have to make concessions to the Palestinians in any negotiations. Netanyahu thanked Trump for his support and his decision to withdraw from the Iran nuclear deal and said U.S.-Israel relations have never been better than under his administration. On Tuesday, Trump lashed out at Iran in his annual address to the U.N. General Assembly, accusing its leaders of corruption and spreading chaos throughout the Middle East and beyond. He also vowed to continue to impose sanctions on Iran.